I learned sadly that Whacker (who befriended many of us in the Naval Base) died yesterday 26-11-2015. 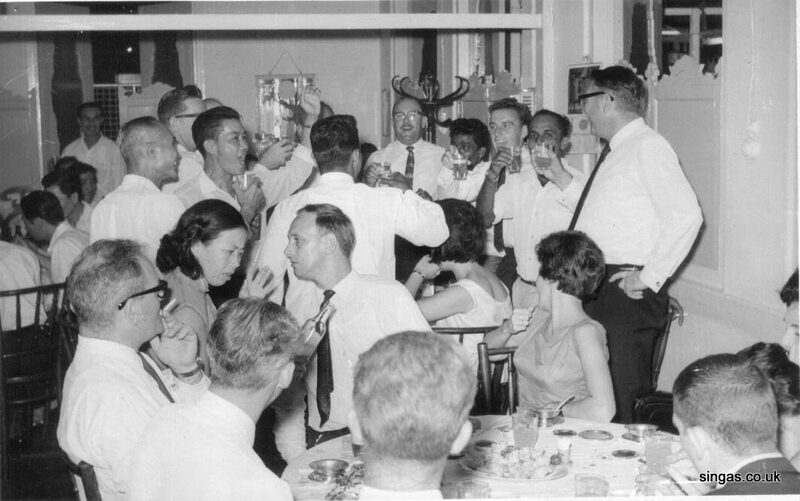 My family knew him well in 1955-58 when he was my brother Barry's friend, seen dining with us in Singapore in one picture, with me, my brother Barry and my mum And dad about 1957. I met up with Whacker on my return to Singapore in February 2013 and again in June 2013 see photo, I am on the right, with Whacker and Pat Alexander on the left. Many tributes paid to him on his Facebook page under Foo Chee Han. A legend never forgotten by all ex pats who knew him. My thanks to John Blyth for these photos. 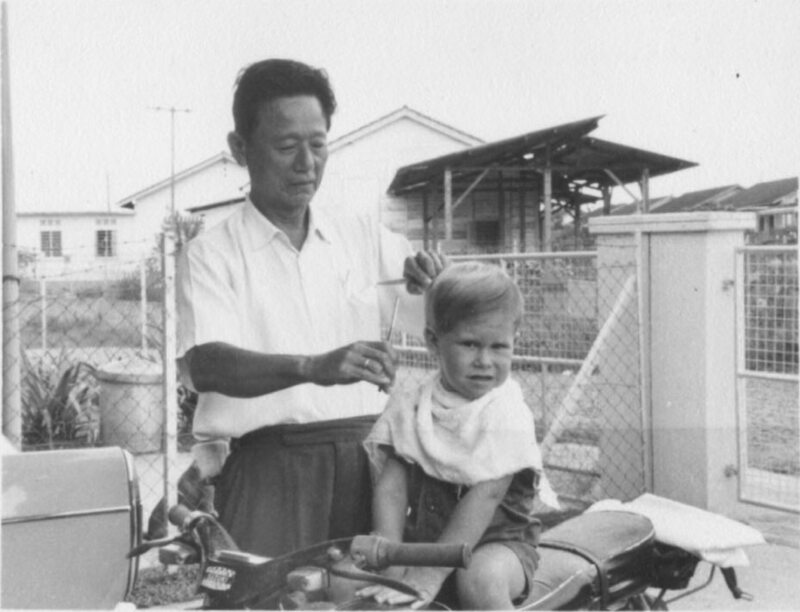 John along with his sister Elaine, lived in the Royal Naval Base at Sembawang from 1964 to 1967. 48 Hobart Road shows me in my cub uniform with dad�s Hillman Minx (Robert Blyth) and our house 68 Falkland Road in the background. The dog was Nobby. We adopted him when someone left Singapore to go back to the UK. 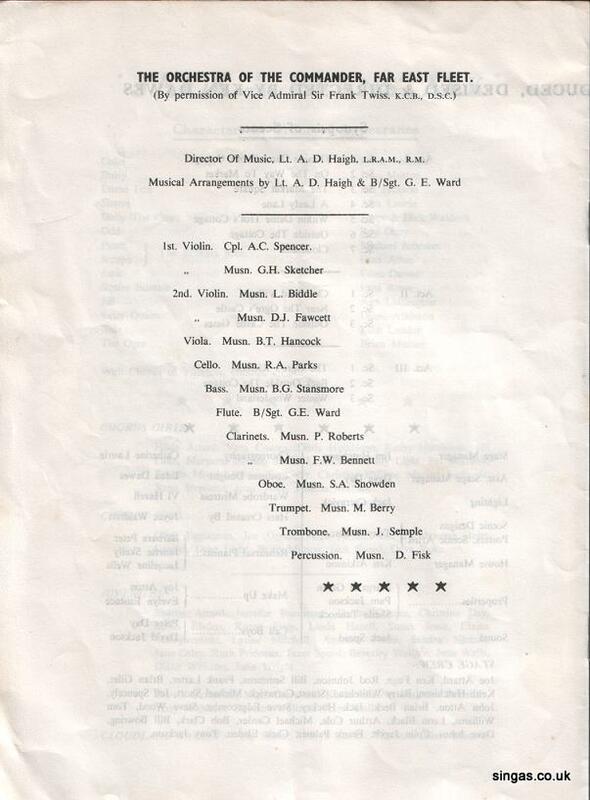 The SVSO Dance was dated December 1966. Robert and Nancy Blyth are front on the left. My mum worked in the Victualling and Stores Offices in the Dockyard. Dad was an engineer on a tug called the Nimble. 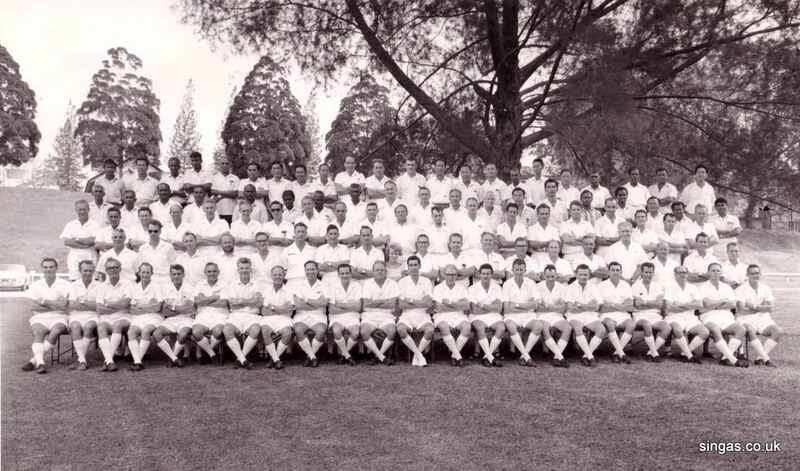 Front row, second left is Jock Laidlaw, and back row first left is Bryan Allan. 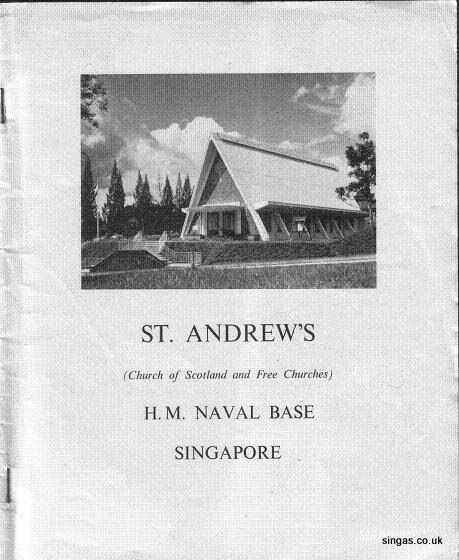 St. Andrew�s Church shows the cover of what was the order of service for 18 December 1966. It was in this church that a childhood myth was shattered when my sister told me that Santa didn�t exist! Dad worked on the Tug Nimble as an Engineer. 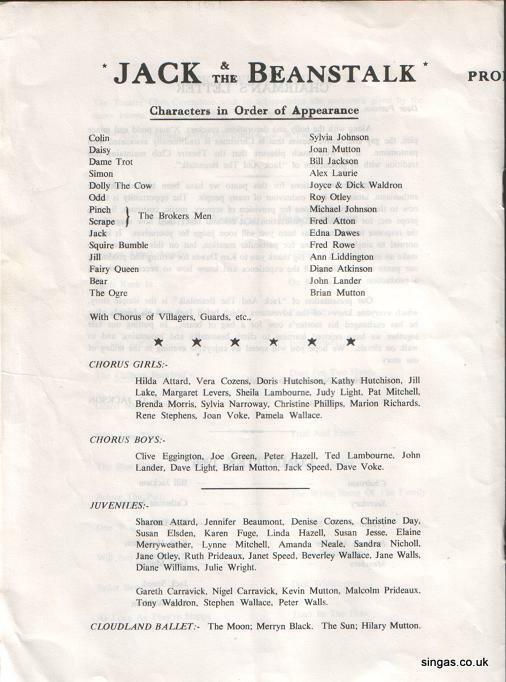 Myself (John) and my sister Elaine Blyth are seen on the Nimble. Me and my sister waiting for the school bus. 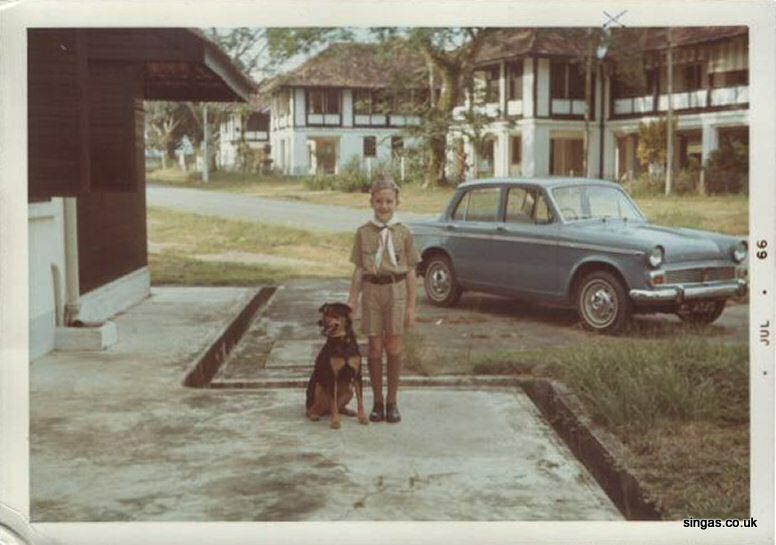 We lived in Jalan Malu Malu outside the Naval Base before going to Hobart Road and then Falkland Road. Cattle sauntering down the road! What would we have done without Wong! Mum was a traditional housewife in Scotland, and took well to having an Amah. She had a tremendous shock when we returned in October 1967 when dad was posted back to Rosyth Naval Base. No Amah in Scotland! 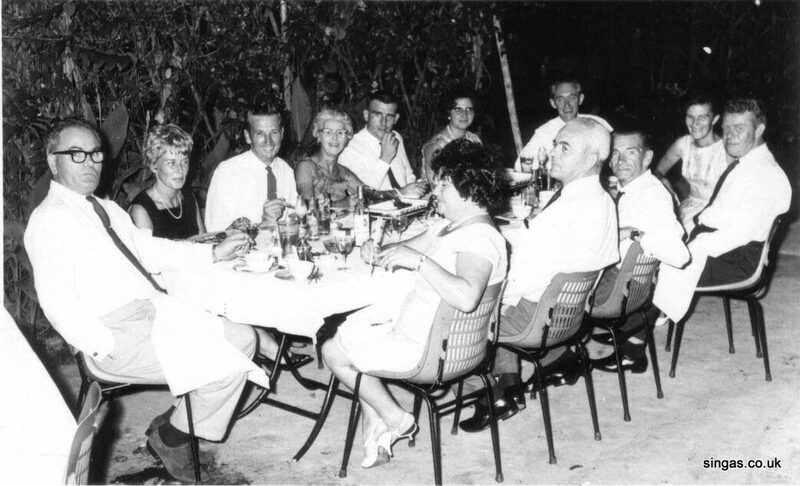 Left to right � Flo Slora, Agnes Blyth, Sheila Henry, ?, George Scoble, ? Left to right � Agnes Blyth is in the middle. Just look at that TV. 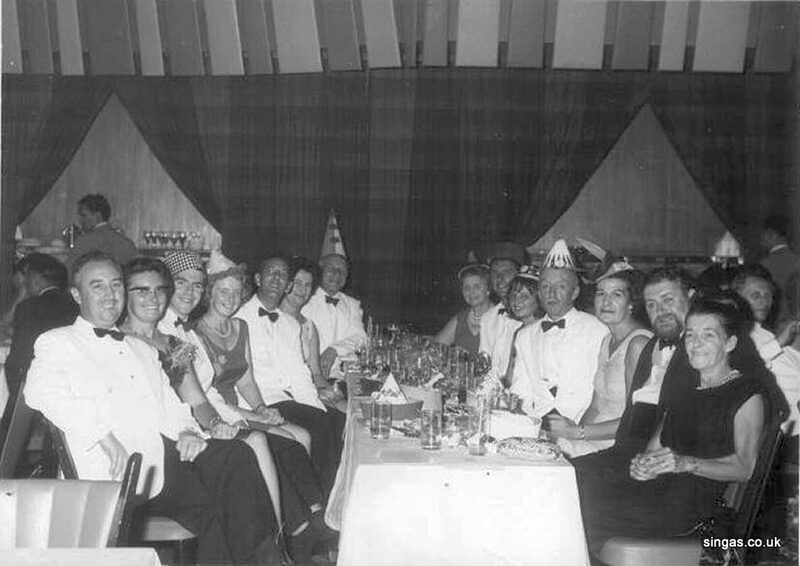 Left to right front � Flo Slora, Agnes Blyth, Sheila Henry, Bob Blyth, Jessie Birnie?, Jim Birnie, ? 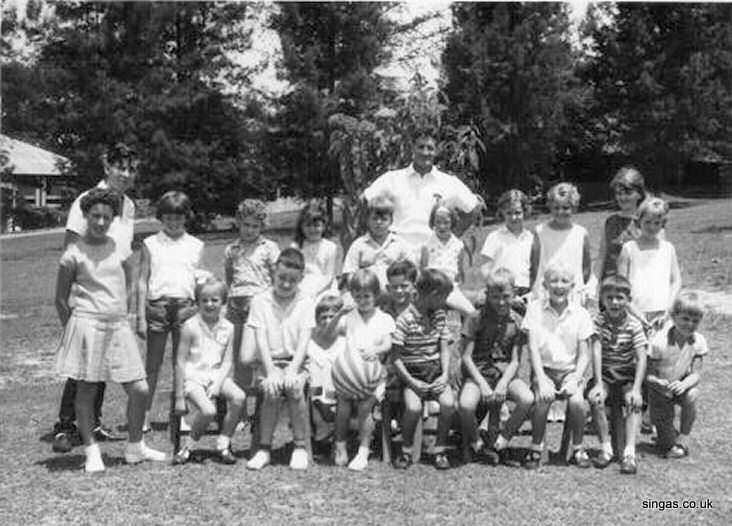 At the back Left to right � Jim Henry, Doris, ?, ?, ? Me and my sister in the smaller pool. 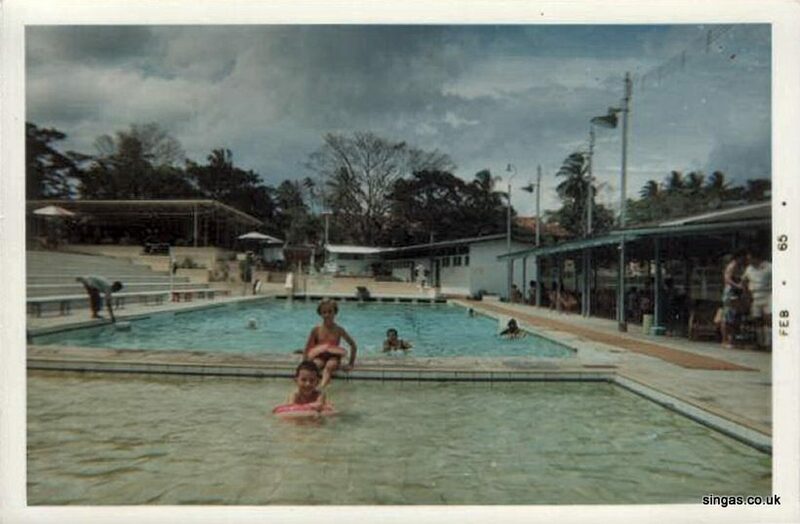 As kids we loved the Singapore Swimming Club and the Dockyard Pool. After we returned to the UK we had some holidays in Scarborough but somehow, the open air pool in Scarborough just didn�t have the warm weather to go with it. 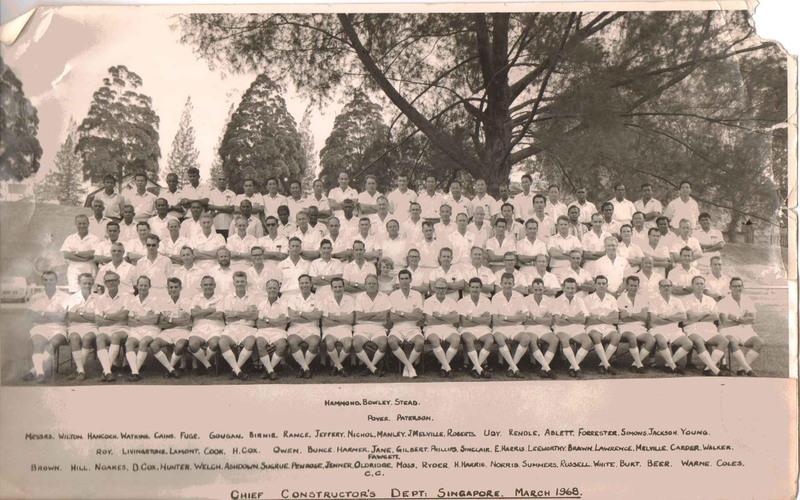 Many thanks to Anna Googan for these photographs taken in the '60s of Naval Base personnel. 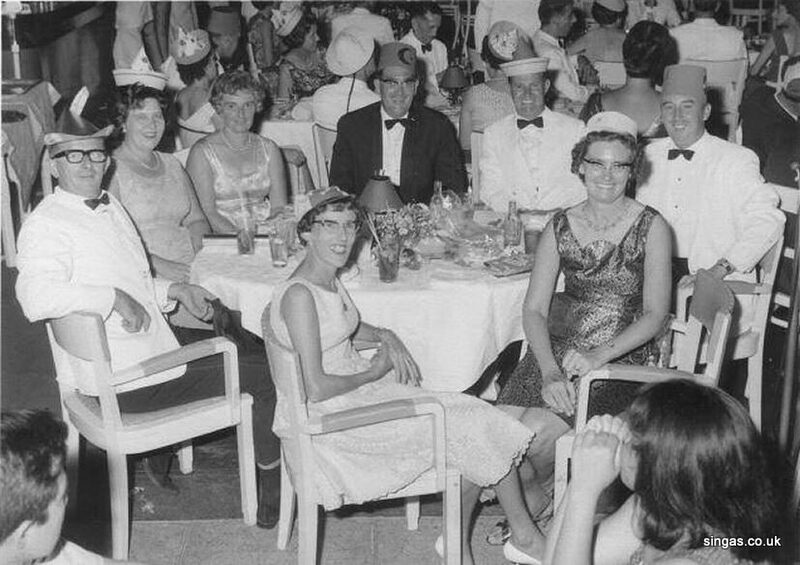 The only information we have on this photo is some writing on the back which says - Mr Googan TG3 (C/M of Shipfitters) Prom (C). I also noticed that there is one small lady in the centre of the picture. This photo is of the Chief Constructors Dept. (Naval Base circa 1968). This one is where my dad, Bill Sugrue, had written out many of the names. No information on this one other than it was at the Tai Tong Restaurant. 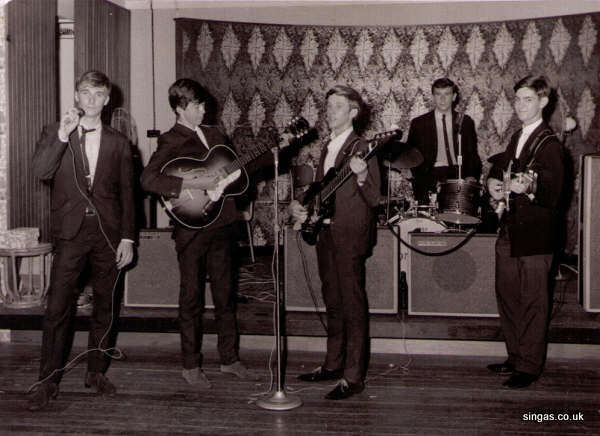 Base at the Dockyard Club Christmas Dance Dec 1966. 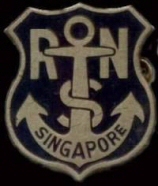 Chris was in Singapore form April 1964 to January 1967. My thanks to Bernard Mennell for this photo. Bernard said in his email "I notice that your fascinating site has no reference to the Civilian Messes in the Naval Base where single/unaccompanied staff lived. I had a wonderful time living briefly in No 2 Mess in Mata Road from Dec 1970 to March 1971 - the photograph shows the main living quarters with part of one of the Accommodation Blocks. Half a mile away next to Beaulieu House was No 1 Mess, that accommodated more senior staff and was reputedly less fun! Both closed in October 1971. 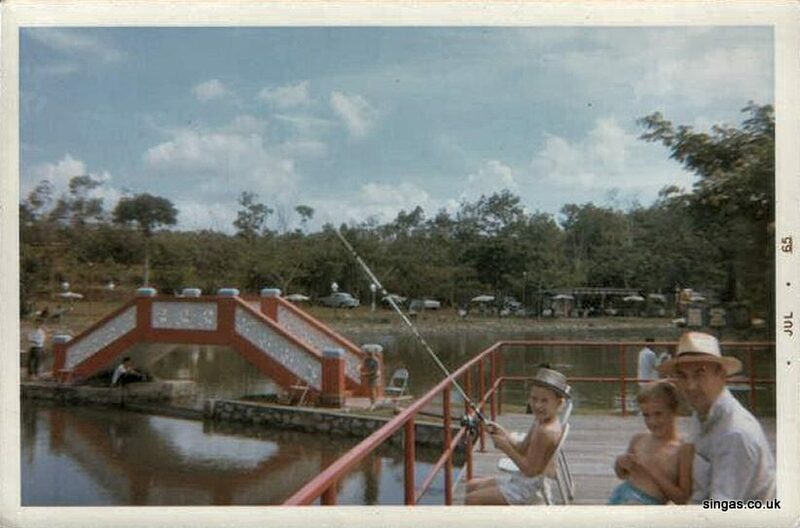 The area is now Sembawang Park but there is no trace of either Mess. 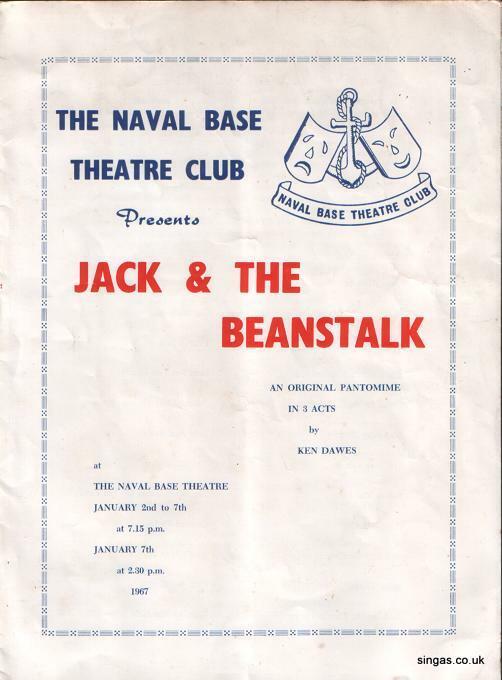 I don't know how many such civilian Messes there once were, but the official 1968 plan of HM Naval Base identifies a No 6 Mess in Jamaica Road." 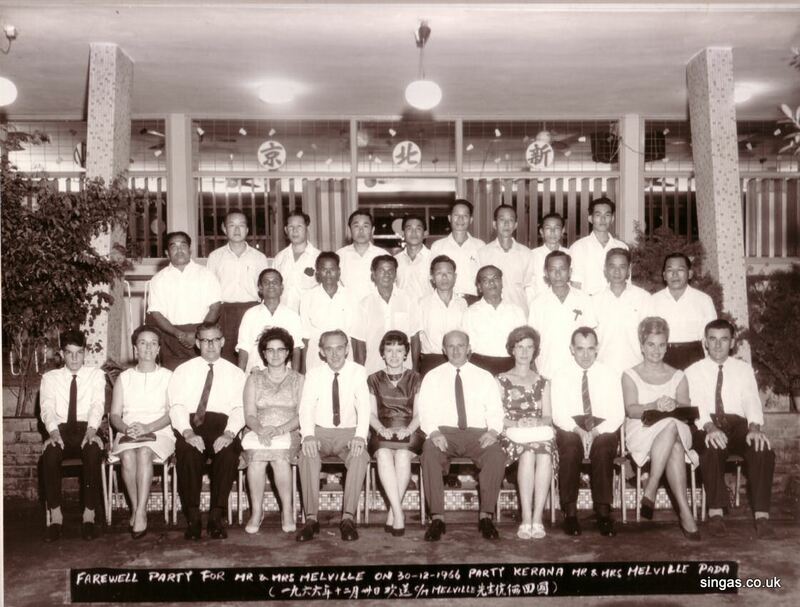 My thanks to John Mitchell, who served in the Electrical Dept of Singapore Dockyard and Sembawang Shipyard from 1967 to 1970, for these two photos. John Mitchells' three children Susan, Julie and John attended the RN Naval Base School, Susan went on to Bourne. 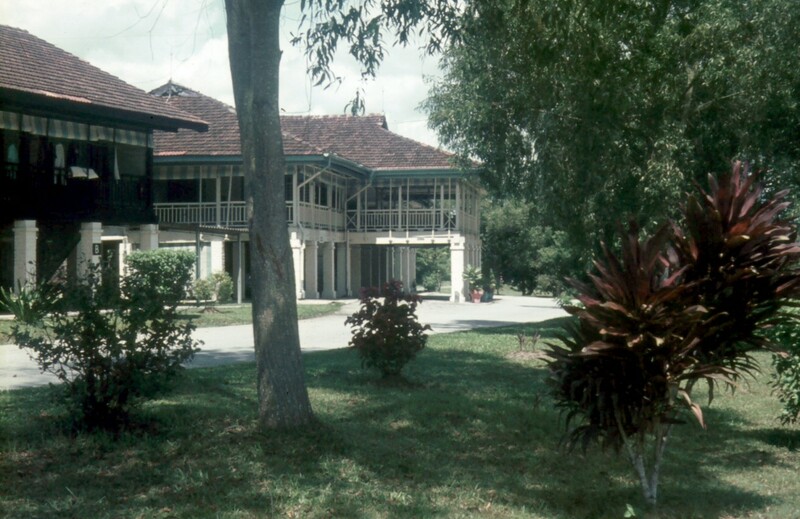 They lived initially in Sembawang Springs then inside the Naval Base. Our Amah, Amoy, and her daughter Lai Fong (Moi Moi), at Lagos Circle. 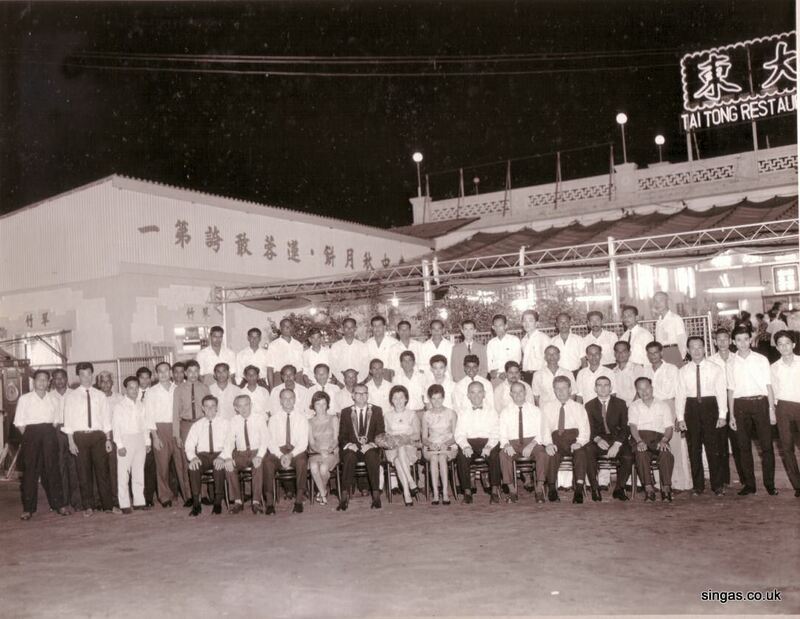 We would dearly like to hear something regarding Amoy or Lai Fong. 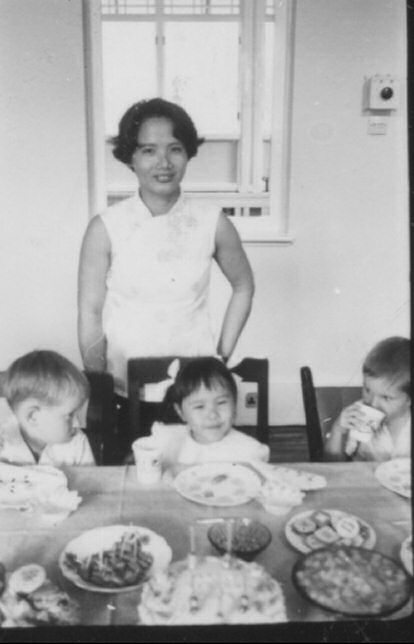 Amoy had two other children (both boys).